There’s nothing tremendously innovative in the story for Rise Of The Tomb Raider, the second installment in the newly rebooted series of action-adventure games starring Lara Croft. 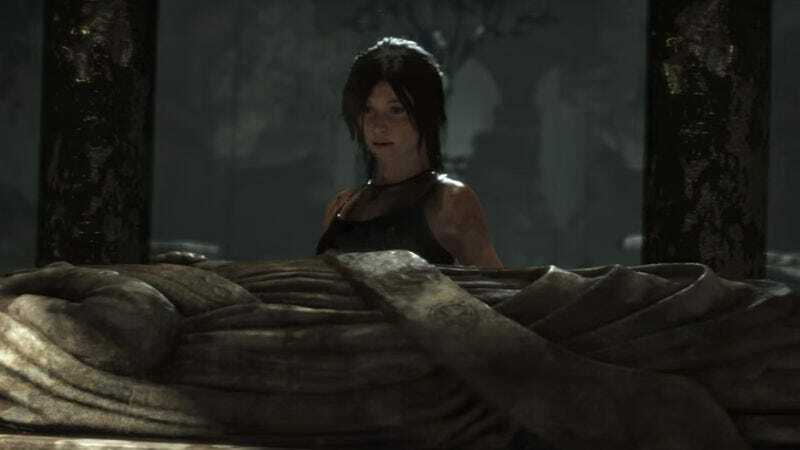 As far as game narratives go, it’s essentially boilerplate Hollywood nonsense, featuring the young but newly confident Lara (the events of 2013’s debut story having toughened her up) on a quest to rescue her father’s ruined reputation by uncovering the lost city of Kitezh, and its supposed promise of eternal life. As she goes about the derring-do of solving puzzles, fighting bad guys, and generally being the face of an incredibly fun and exciting game, emotional resonance doesn’t exactly come into the picture. Not that the game doesn’t try: Periodic flashbacks show her life as a little girl, watching her loving and attentive father slowly unravel as pubic ignominy plunges him into darkness. They’re meant to ground the character and bring depth to an historically shallow heroine, and while it manages to add dimension to the protagonist, it’s also perfunctory storytelling, trite and uninspired. Uninspired, that is, until Karen O’s song provides the soundtrack to your victory. As the final cut-scene fades, and the admittedly somewhat bittersweet conclusion segues into the credits, O’s haunting track “I Will Rise” begins. A sparse guitar melody echoes quietly (performed by David Pajo of Slint, Tortoise, Zwan, and many other excellent groups) and sets the tone. Unlike the pounding score that accompanies most of the game’s adrenaline-fueled high points, “I Will Rise” is more elegiac than pulse-pounding, a languid track that slowly smuggles in its bombast, so gradually that it almost takes you unawares. The refrain speaks to the damaged but undeterred resilience of Lara, beaten down by circumstances yet always rising above her conditions. “They know’ll my name,” she cries, “after storms are passing through,” and it’s a call to arms, measured and indomitable. Honestly, it’s not that far removed from a James Bond theme song; with its sultry tempo and slinking rhythms, it could be mistaken for a Roger Moore-era entry in that canon of music. But it’s more resonant than that, because Lara Croft is a more relatable hero. Especially after having just guided her through the perils of Rise Of The Tomb Raider, the austere beauty of “I Will Rise” retroactively lends poignancy to a story and protagonist that had little. Not that such added weight is needed—much of the fun of the series is what a joyful treat it is, kinetic and breezy and light as air—but letting yourself be won over by Karen O’s stirring ballad creates an emotional connection, all the more rewarding for being so unexpected.